Project kickoff reception Feb. 15 from 5-7 p.m.
More info: Jane Maginot, Washington County extension office, 479-444-1755, or by email at jmaginot@uaex.edu. In its third year, the 2014 project will add to the existing 19 storm drains in Benton and Washington counties that have been painted with educational messages. 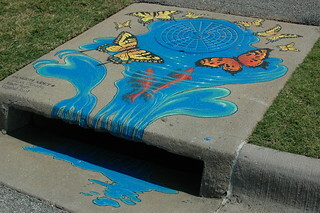 “UpStream Art gives artists a chance to express their imaginations in an educational channel through a series of a small-scale outdoor storm drain murals,” said Jane Maginot, extension urban stormwater educator for the University of Arkansas System Division of Agriculture. Artists are being invited to join the effort by submitting an application by March 14. Applications may be obtained either by contacting Maginot at 479-444-1755 or jmaginot@uaex.edu or visiting www.nwaupstreamart.com, to find applications, requirements, pictures and more details on specific storm drains. The purpose is to help people understand that storm drains are not the same as a city’s sanitary sewer system. Any materials that go into the storm drain goes directly back to nature. “Whatever you see in the street -- cigarette butts, leaking oil, antifreeze, pet wastes -- all of those pollutants, plus whatever the water picks up as it washes across parking lots and roadways, goes directly in its untreated state straight into our local streams and drinking water sources such as Beaver Lake,” Maginot said. Fayetteville Underground will be hosting a kickoff reception on Saturday, Feb. 15, from 5-7 p.m. at its gallery space on the Fayetteville square. Project representatives and previous artists will be available to answer questions about UpStream Art and show off the previous years’ art. The project includes 12 drains in Benton and Washington counties. Partners in this project include the City of Bella Vista, City of Bentonville, City of Fayetteville, City of Springdale, Fayetteville Underground, The Jones Center, University of Arkansas System Division of Agriculture Cooperative Extension Service, Walton Arts Center Artosphere, Seal Krete, and the Northwest Arkansas Stormwater Education Program. For more information, contact Jane Maginot, Washington county extension office, 479-444-1755, or by email at jmaginot@uaex.edu.